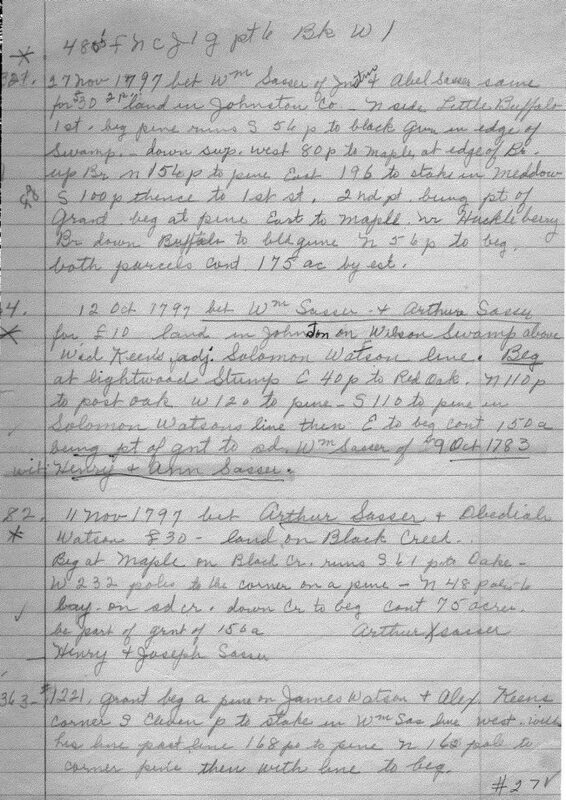 27 Nov 1797 bet Wm Sasser of Johnston and Able Sasser same for S30 2p land in Johnston Co. n side Little Buffalo. 1st beg pine runs S 56 p to black gum in edge of Swamp. down sup. west 80 p to maple, at edge of Br. up Br n 156 p to pine East 196 to stake in Meddow S 100 p thence to 1st st. 2nd pt. being pt of Grand. beg at pine East to Maple. nr Huckleberry Br down Bufflalo to blk gume N56 p to beg. both parcels cont. 175 ac by est. 12 Oct 1797 bet Wm Sasser and Arthur Sasser for £10 land in Johnston on Wilson Swamp above Wid Keen’s adj. Solomon Watson line. Beg at lightwood Stump E40p to Red Oak. N110p to post oak W120 to pure S110 to pine in Solomon Watsons line then E to beg cont 150 a being pt of gnt to sd. Wm Sasser of 9 Oct 1783 wit Henry and Ann Sasser. 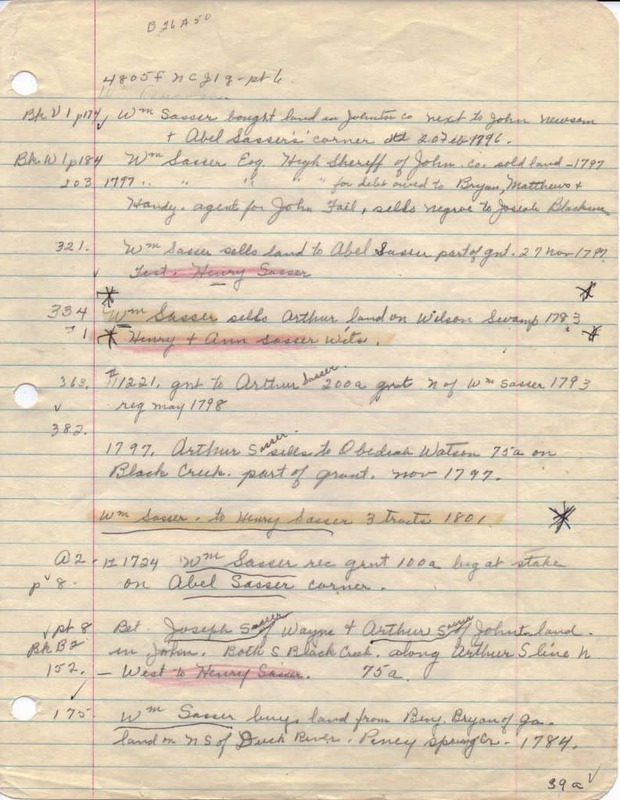 Wm Sasser sells Arthur land on Wilson Swamp 1783 Henry and Ann Sasser wits. Do not know the source for these records extracted by Jennie Weeks for the family.